Drifting Sands Press has today published our first English language book, and also the first ever general interest non-fiction book about Global Nomads. For this book, we had the pleasure of interviewing thirty global nomads from all over the world. They are professional travelers who wander the world without a permanent job or home, they are modern-day adventurers and vagrants, no one’s property. The new book describes what perpetual traveling is like, how to make a living on the road, and it explores wheather the traveling life means a liberated and happier existence. We started our journey through India from medieval feeling Kolkata watching beggars and bare-feet men draw rickshaws, and we smelled the stench of urine and learned to dodge numerous human droppings on the streets. In Kolkata’s backpacker ghetto in Sudder Street, we also got to know the two main types of travellers that are drawn to India: drug addicts and spiritual travellers. For us the big question our journey evoked was: can there be spirituality without love? Great news! 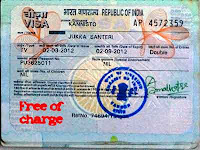 India grants free 6-month visas to everyone who applies for a visa on their web site today. After your application is approved, the free visa will be waiting for you at the airport upon your arrival. We arrived in Myanmar thinking about travelling a bit around, visiting some temples, and enjoying similar kind of vegetarian delicacies like in Buddhist Laos. After resting three weeks in Yangon, we are happy to leave and continue our travels.